John’s Incredible Pizza is a famous pizza chain that offers a mix of great tasting pizza and other food items with indoor games and rides resulting in the ultimate FUN environment in one location. The all-you-can-eat buffet concept at John’s Incredible Pizza includes pizza, pasta, soup, fried chicken, salad and an assortment of sides. Along with great food, each location offers over 100 games, amusement park rides, and themed dining rooms. John’s Incredible Pizza is the perfect location for a birthday party or a family night out. All military service members and their spouse and children receive 10% off their buffet & beverage purchase with valid/active Military ID Card (tan, red, green or blue). Curious about the theme rooms. Search no more. Each location houses 5-6 different theme rooms. Stay and relax in the Cabin Fever room. If you love sports, claim your table in the Hall of Fame room. Like watching extreme sports athletes defy gravity? Check out the Vertical Room. Everybody likes watching and dancing to music videos. Head over to the Fusion Room. Adults need their own special place. The Veranda Room is for them. For those guests that enjoy watching cartoons on TV, the Toon Time Theater is the place to be. John’s Incredible Pizza is always looking to add hard-working, outgoing team members that thrive in working in a fast-paced, fun environment. 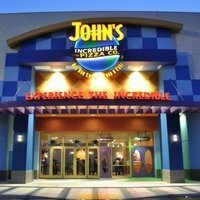 Future team members can view all current openings on the John’s Incredible Pizza Employment page online. For more information about John’s Incredible Pizza, visit their official website. What are the typical hours of operation for John’s Incredible Pizza? Does John’s Incredible Pizza serve alcohol? John’s Incredible Pizza does offer beer, wine, and margaritas. How much is the card for the games? How much for the food?